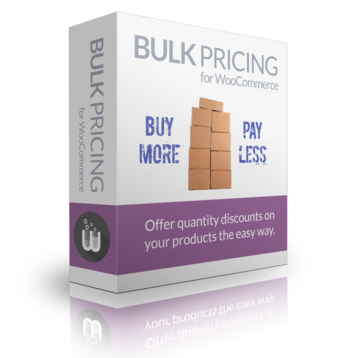 The Bulk Pricing for WooCommerce plugin will enable you to set up bulk pricing rules for single products or whole categories with just a few clicks. Create an unlimited number of discount rule sets and choose from those predefined rule sets when you edit a product. Or define individual pricing rules directly on the edit product page – or use the built in hierarchical categories page where you can assign rule sets for all your product categories on one page. Each product category can have a different discount ruleset. Visit WooCommerce -> Bulk Pricing -> Categories and select a ruleset from the drop-down menu for each category. Bulk Pricing settings are also available at the edit product page so you can assign rulesets or create custom discount rules on the product level. In addition to bulk pricing rules this plugin allows you to set up global discount percentages for selected user roles. This allows you to give certain VIP or wholesale users a fixed percentage discount on all your products – without the need of an additional plugin. You can define global discounts at WooCommerce -> Bulk Pricing -> User Discounts. Enter a percentage next to a user role to enable global discounts for all customers who are assigned to this role. You can select if normal bulk pricing rules should also apply to these customers (on top of the global discount) – or if they should receive their global discount only. You can enable or disable all bulk pricing discounts for certain user roles. Export and import all rulesets as JSON or CSV. 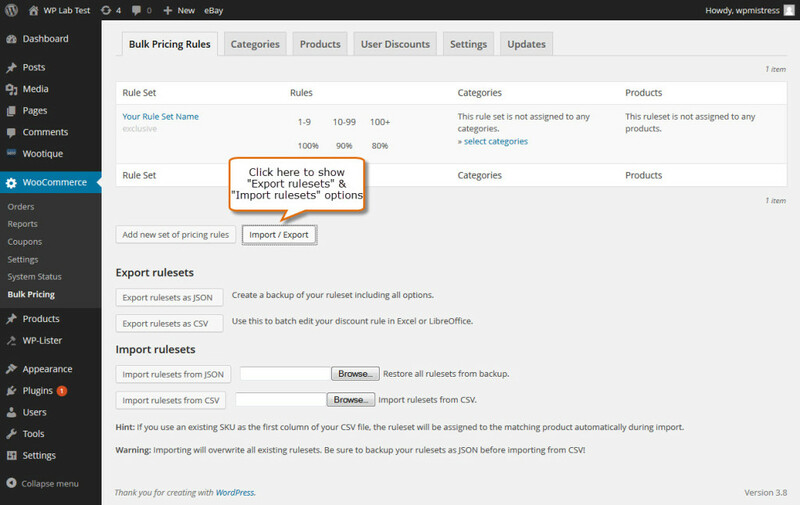 When you import rulesets from a CSV, the plugin will automatically assign rulesets to products with a matching SKU.